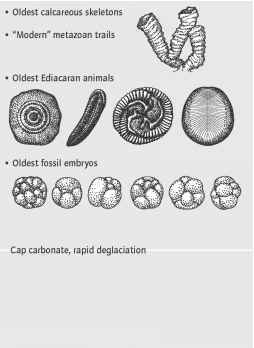 The evolution of hard parts greatly improved the fossil record. The diversity patterns of the Phanerozoic seas were documented by Professor Jack Sepkoski, and the resulting diagram is usually referred to as Sepkoski's curves (Fig. 16.2). Diversity is the net product of the originations of species minus extinctions at any one time. This graph shows that species diversity has increased overall through the Phanerozoic. Over 800 families are now known, as opposed to around 200 in the Cambrian. However, this increase in diversity has not been uniform. 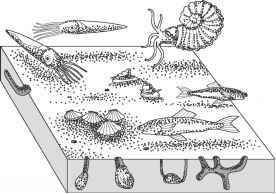 There have been at least two periods of apparent stasis, one during the Cambrian and early Ordovician, and one through the Silurian to Permian, when diversity seems to have reached a temporary maximum. In addition, there have been major falls in species diversity as a result of mass extinctions. The largest of these was the end-Permian event, when species-level diversity dropped by around 95%, and family-level diversity fell by more than half. Abiotic effects seem to have influenced the shape of these diversity curves. An obvious example is the apparent relationship between the formation of the supercontinent of Pangea and the end-Permian mass extinction. Major continental break-ups, such as those of Pangea through the early Mesozoic, and of Rodinia during the Cambrian, seem to have resulted in increased adaptive radiation. This may be because continents were becoming isolated, causing biotas to evolve independently and increasing species diversity. Conversely, as supercontinents form the range of habitats declines and species diversity decreases. Changes from icehouse to greenhouse states may also have had an impact on species diversity, though this is a less clear relationship. The abrupt transition from greenhouse to icehouse in the late Ordovician may have brought about the end-Ordovician mass extinction. However, other similar transitions, for example in the Carboniferous, appear to have had no effect. Fig. 16.2 Diversity curves through the Phanerozoic (Sepkoski's curves). Fig. 16.3 Sketches of evolutionary faunas: (a) Cambrian, (b) Palaeozoic, and (c) Modern. Biological events have also been extremely important in controlling diversity. Three different faunas can be identified through the Phanerozoic (Fig. 16.3). These faunas share common patterns of evolution and extinction and may have constituted real evolutionary assemblages of organisms living in the shallow seas. The Cambrian fauna was the first to appear and was dominated by arthropods, particularly trilobites. 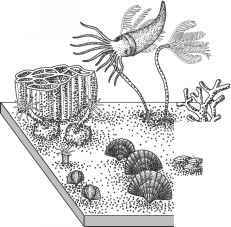 Most of its common animals were mud-grubbers, living on the sea floor. This fauna was replaced during the Ordovician period by the Palaeozoic fauna, which included a greater proportion of filter feeders and predators. In turn, this fauna was replaced after the end-Permian extinction by the Modern fauna, characterized by aggressive predators and burrowing invertebrates. Palaeozoic fauna dominated by corals, crinoids, brachiopods, predatory cephalopods, and by graptolites in deeper water. This fauna is more tiered than that of the Cambrian, with organisms living on, and growing above, the sea bed. Reefs and other biotherms become common. Many organisms filter feed from sea water, whilst others forage on the sediment surface this physically, by growing above and below the sea floor, and biologically, by introducing innovations of feeding method and increasing predation. These innovations offer a good explanation of the three-phase increase in diversity seen in the overall diversity curve. The possible effects on past life of changes in climate and concentrations of greenhouse gases (e.g., CO2) in the Earth's atmosphere are of increasing interest. Climate records are fairly reliable and of high resolution throughout the last glacial cycle, back to c. 2 million years ago. It is now possible to estimate global temperatures and the amount of CO2 in the atmosphere as far back as the Palaeozoic. This picks out some apparent relationships between the diversity oflife and changes in climate. For example, the diversity of mammals dropped significantly during the thermal maximum at the Paleocene-Eocene boundary, when global climate probably heated up by c. 6-8°C and temperatures at the poles may have reached 23°C at sea level. Computer models have been developed that predict likely levels of atmospheric CO2 back to the early Palaeozoic, and these can be tested to some extent by using data from the number of stomata on plant leaves and from isotopes such as strontium that are useful proxies for rates of weathering. One computer model, called GEOCARB III, predicts that global levels of CO2 may have been over 10 times that currently found in the atmosphere for the whole Palaeozoic, with a local peak in the Carboniferous of around 20 times present levels. The fact that this was a period of high and innovative evolutionary rates and also a time of prolonged glaciation suggests that much still remains to be understood about the dynamics of our Earth system and its influence on life.